Fred's world is filled with fantastical friends that make his days so much fun he hardly notices that no one else can see them. But one day Fred goes off to school, and things start to change. As Fred grows up, his childhood friends slowly fade away and see to disappear, taking some of life's sparkle with them. But a chance meeting with a special young girl reminds Fred - and readers young and old alike - that magic and wonder never really disappear... they live forever in our hearts. Fred is a lovely picture book about the power of childhood imagination and how that diminishes as an adult. Fred's imaginary friends are wonderfully fantastical and equally endearing. The strength of this book lies in its smile-inducing illustrations, as seen here by this adorable motley crew. Fred would be a perfect book to pair with or gift to the child who loves The Adventures of Beekle by Dan Santat. 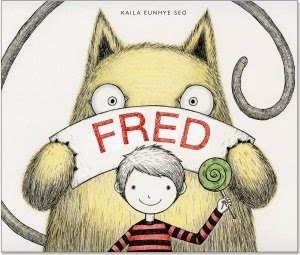 Thank you to Peter Pauper Press, who is providing one lucky reader of this blog with a copy of Fred by Kaila Eunhye Seo. U.S. addresses only please! Use the Rafflecopter widget to enter. I never did have an imaginary friend as a child, unless you count all my stuffed animals who I talked to and made up stories with. Can't wait to read about Fred's! No, but did have an imaginary horse. I did not have an imaginary friend, but I used to go under my blanket and call it Lee Lee land (my blanket's name was Lee Lee). It helped me calm down :) Even though I didn't have a specific imaginary friend, I loved playing pretend!